I had my once-a-year Frappucino from Starbucks (thanks to their "free drink" birthday card they mailed me) - I used to drink their sugary flavored drinks quite often, but gave them up when I started losing weight. And I don't bother with the sugar-free drinks - they just taste funny to me. But once a year, I indulge. This was the mocha-coconut-frap, and boy was it tasty. Plus, with the free drink, they give you the biggest size! It was my lunch - I'm sure it had plenty of calories for a meal, but it did not hold me like a normal lunch would have. Oh well, totally worth it in any case! I also got a pedicure, and completely changed things up from my normal blue or purple polish - I'm really loving orange, so I went with it. My toes make me smile every time I see them. And my birthday wouldn't be complete without a trip to Red Mango, where I had some coconut yogurt - how nice of them to have my favorite flavor on tap on my birthday! Picture of me is quite lovely - apparently at 48 I've decided I'm too lazy to wear makeup I don't need makeup or to style my hair anymore. Plus the 100 degree temperature sun was shining in my eyes when Jeff took the picture so my squint is especially nice. Ahhh, 48 - the age of letting it all hang out! Wednesday was National Running Day, as I saw over and over again on Facebook and on many blog posts. And it only killed me a little inside each time. I remember dragging Jenny out to run last year on NRD - we had worked out with Brad and were limp noodles, but I insisted. Just a mile - but we ran! Next year, National Running Day - we have a date...mark my words. This morning, I'm going to be brave and not only swim for an hour, but also do a yoga class afterward. I've never done both in the same day, but it takes me at least 15 minutes to drive to the gym, and I would barely have time to go home in between swimming and yoga - plus, I spent $72 to fill up my car with gas the other day, so I'm not going to waste it! I was doing yoga at the gym closer to my house, but when I had to change my membership, I could only choose one location (for my fee), and I had to pick the one with the indoor pool. It will still be the same instructor, although the class is called "Senior Yoga" - I don't know what would be worse - that they kick me out because I'm not a senior, or that they welcome me because they think I AM one! Comfort zone - I am feeling a little outside of mine at the moment. We finally have a quiet weekend ahead - only a 4 mile run with the running club on tap for tomorrow morning (well, for Jeff - I'll be walking 2 miles), then panqueques at IHOP. Nothing else pressing - ahhhhh. Hope you all have a great weekend! I shall walk two miles with you, Sister!!! I don't think 48 is Senior. Woo, what a nice way to celebrate. Good for you! Enjoy the yoga/swimming challenge, and a restful weekend. You've earned it! Lovely day, 100 degree temps and all. You will totally be able to do the swimming/yoga because you are a ath-a-lete! Your orange toes make me smile. I will be walking those 2 miles with you. Sounds like a real nice, low keyed birthday. You deserve it. I have been saying "I'm almost fifty" since I turned 49 back in March. I keep thinking that if I hear it enough, I get used to it. Happy B-Day! Do you still ride your Electra? I have a "Betty" cruiser, and I am crazy in love with her! I think your son is so cute, I had to laugh about his comment. You got two amazing great and funny boys. That's the way a birthday should be spent and you did it the right way. Looks like a fabulous day to me. Have fun at the swim and yoga. Let us know how you like it doing both at the same day. (hugs) to the birthday girl. Happy Belated birthday! It sounds wonderful. Oh, and I love the orange toes. That sounds like a PERFECT birthday. GREAT food choices. I love Texas Roadhouse. It is my birthday dinner of choice! I might have to celebrate your birthday tonight with some frozen yogurt LOL. WHat do you mean by damage control? hmmmn? That Frapachini is probably enough calories for a month. So you better watch it. You'll be up with Helen and her few weeks to lose 900 lbs before she leaves for "the island." Also, my toes make me laugh too. Oh, and they make Hannah laugh. Though it has nothing to do with the color they (are not) painted. Why is it we have to eat to celebrate? I should have sent you some See's only they'd have to wrap it against the heat of TX. So glad you had a great birthday! I have been so swamped at work, I forgot to send you a side email. 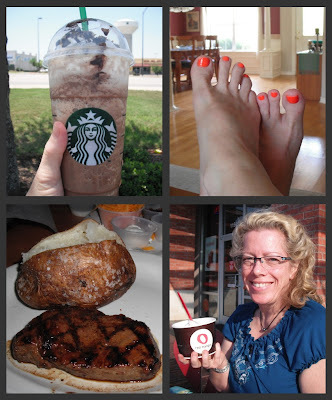 Love the orange toe polish, and your mini-indulgences! Hey, I am 43 and I still try to get into the early bird specials - I am frugal that way! Hugs to you - have a wonderful weekend!! Sorry I missed your birthday! Glad that your day was so special! I hope your busy, active morning went well.. I am really craving some yoga in my life! Sounds like a good birthday. Found your blog from Frans. Sounds like a great birthday!!!!! Love the orange toenails! I bow at those toenails for swimming and yoga back to back! :) Have a great rest of your weekend. Happy Birthday! I missed it and I'm sorry. It sounds like you had a fabulous day!